What a beautiful, soul-fulfilling, challenging, busy, and memorable year it has been been. My 2018 has had many ups and downs, some messy moments, and some truly incredible “have to pinch myself” moments. Today I am sharing my highs, lows, and lessons learned from 2018. I am also sharing my 2019 intentions, goals, and happenings. Thanks for being here! There were a lot of highs in 2018. I found a home base in Washington, read 30 new books, wrote my OWN book, traveled to some amazing new destinations, ventured back to some old favorites, spent many a night camping out in the wilderness, and finally ended my struggle with acne. I made some amazing new friends, had family visit from Australia, visited family in Australia, did some things that terrified me, worked with numerous dream clients, doubled my yearly income goal, got my blog and branding to a place I’m really happy with, and so much more. Many of you have asked what my favorite travel destination was this year… and I don’t think I could say just one! My favorite winter adventure was definitely our week long Alberta road trip in February. I would say my favorite tropical destination was probably Tulum, which was a close win over my trips to Bali this year and our week on Oahu. For adventures during fall, there is no doubt about it that our New England road trip was my favorite, with the Canadian Rockies coming in at a close second. The trip I most enjoyed during spring was our getaway to beautiful Reno Tahoe, where I am not surprisingly finding myself again for this NYE. My favorite mountainous adventures were my trip to Peru with Acanela, and hiking trips around Alaska during July and August. I had an incredible time in Scotland with Sony, and it’s probably the place I most want to go back to out of everywhere I traveled in 2018. Some other highlights were showing my parents around Wyoming in spring, taking a scenic flight over Grand Teton National Park, visiting family in Australia, and traveling to New Zealand for our friends’ beautiful wedding. I am so so thankful for all the adventures I was able to take in 2018! I set myself 10 goals in 2018, and I have been able to tick off 7 of them. In hindsight, I realize that the 3 goals that I didn’t achieve were not specific enough and also involved things that weren’t necessarily in my control. I did do one thing in 2018 that absolutely changed my life. Early in the year I wrote a journal entry dated 12/31/18. I wrote it in the present tense, like everything I was saying had already happened. I wrote down some pretty crazy things and every single one of them came true. I’m not joking, this kind of manifestation is powerful! I manifested that I would spend New Years with friends in an incredible location (which I am doing as I write this), that I would make my dream income (which I went on to double by the end of the year), that I would see all my family members and get to show them around Seattle (happened, multiple times), that my husband and I would find a home we love in Seattle (done), that I worked with some of my dream clients (that happened), that I got my blog and branding to a place that I was happy with (yep), that I cleared up my severe acne (so thankful this one happened), that I felt physically and mentally fit, strong, healthy and happy (yes), and a few more things that all came true! The reality is that most of these things came true by mid-2018, proving to me that I can dream bigger in 2019. I will likely do a blog post about the law of attraction and manifestation, because it’s something I have been getting a lot of questions about. And of course (because I’m human) there were some lows… I overdid it on the work front a few times, experienced feelings of burn out and overwhelm, had too many nights of lack of sleep from traveling, and had a bad cold during spring that I made worse by “pushing through it”. I missed out on special events back in Australia because we chose to relocate to the US, and spent far too long sitting in cars, on airplanes, and in airports, and (like every creative person that has ever existed) I struggled with feeling like I’m not working enough, not being creative enough, not doing enough. This isn’t all “woe is me”, I’m just being real with you guys. Having an incredible year doesn’t mean there weren’t struggles and a lot of hard and tiring work behind the scenes to keep the wheels rolling. Being home fulfills me just as much as traveling does – this is a lesson I learned in 2018 that I wasn’t necessarily expecting. Don’t get me wrong, I LOVE traveling and wouldn’t change the fact that I am away for so much of the year. BUT I also realized this year that I love those days/weeks of being home in between traveling, and I actually NEED them to wind down, breathe, sleep, catch up on work, and have some self-care time. I learned that I need to prioritize relationships more next year. When I wrote down my long list of everything I was grateful for in 2018, it became apparent that many of those things were time spent hiking with friends, having friends/family over to our house, taking group trips with friends, and on trips where Matt and I were celebrating our birthdays/anniversary etc. I am definitely an introvert so often don’t go out of my way to plan a bunch of social events, but I realized I need to try a little harder in 2019 to make these moments happen more frequently. Investing back into my brand is something I shouldn’t be scared to do – a lesson I learned a few months into 2018. At the beginning of the year I was a little apprehensive to invest money into having a new website built for my blog, getting a new logo designed, hiring someone to assist with my Pinterest account (to drive traffic to my blog), paying hundreds of dollars each quarter to host my mailing list, taking courses to improve my skills, etc. It quickly became apparent this year that amazing things happened every time I invested money and time back into my brand. It always led to more opportunities, audience growth, and financial gain. This year I learned that my intuition is nearly always right. I have been getting more in tune with this over the course of 2018 and now feel like I can “go with my gut” so much more than in previous years. I think it comes down to believing in myself, my work, and knowing (through experience) that my first instinct is often the right choice. I learned that I thrive with routines, systems, scheduling and planning. I usually travel very spur of the moment and my husband and I will typically go with the flow when we are on adventures. This year I learned that when it comes to being at home, I really enjoy having a morning routine, a structured planner where I schedule time to complete tasks (personal or business related), and a means to track my goals. I will be doing a blog post soon about my morning routine because it has been incredibly helpful for me this year! I can write a book. Early this year my husband and I signed a contract with a publishing house to release a coffee table book about our 59 National Parks trip. The book consists of approximately 20,000 words and has a strong story telling element running through it. I kind of went into the writing process thinking I wasn’t talented enough, creative enough, and was wondering if anyone would want to read my words. I threw these thoughts aside and just dove into it, dedicating hours to writing, and pouring my heart into the stories. I’m proud of the manuscript and cannot wait to see it alongside our photos in print next year! I’m mixing it up in 2019 and have chosen two guiding words for the year ahead. It’s my first time doing this and I figure why not give it a try?! My words are gratitude and abundance. In 2019 I want an abundance of love, joy, friendships, creativity, new experiences, and money in my life. Yes I said money… it’s okay to want money guys! Money buys incredible experiences and things that bring safety and happiness into your life. You’re not a bad or greedy person to be actively seeking ample of money in your life. In 2019 I want to always feel a deep gratitude for the abundance in my life, for the amazing people that surround and support me, for the extreme privilege for getting to work for myself in a job that I love, and for the journey in its entirety (yes, even the low points and struggles, because those are inevitable and part of the process). In 2019 I want to keep up a daily gratitude practice whilst I work towards making my wildest dreams come true… and remaining thankful for the now. I want to surround myself with people who live with a zest for life, who have real conversations, and who exude gratitude. 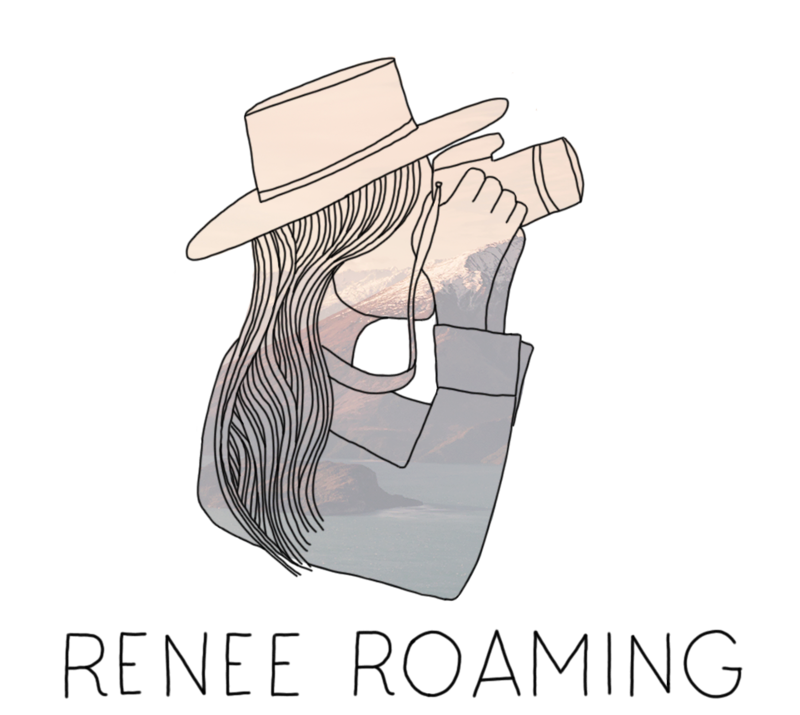 I have also set some intentions for my brand, Renee Roaming – this blog, my Instagram, and my photography. In 2019 I am endeavoring to share real stories from my adventures and those I encounter along the way. I hope to continue inspiring all kinds of people to get outdoors, enjoy nature, and travel to new destinations. I am aiming to open people’s eyes to new ways of living and thinking, reduce prejudice, and encourage people to get out of their comfort zones. I set myself some goals for 2019, which I have shared below. Note that I have modified and left out a couple of the goals on here to be a little more private for the purpose of sharing this on the internet. I also wrote another journal entry dated 12/31/19. I dreamed up some big things this time! I’m not going to be mad if they don’t all come true, but I am going to actively live my life as if they will. The active step is the most important part of goal setting and manifestation, for without it you just have dreams that will most likely stay only dreams. Some new destinations on my radar for 2019 are Antarctica, Bhutan, Oman, Greenland, South Africa, Tanzania, Spain, Northern Norway… just to name a few. I hope you enjoy following along, and thank you, thank you, thank you for being part of this journey, for your support, encouragement, and inspiration. I love this community – you guys are the best!! I would love to hear some of your 2019 intentions, leave them in the comments section below! Need some trip inspiration for 2019? Very inspiring words Renee. I hope your 2019 is everything you dream it to be. Brilliant Blog Renee – really enjoyed reading this, thanks for sharing ? Happy New Years Renee! I’ve been following you for over 2 years now and love your IG and blog. Hope you meet all your goals for 2019 and I can’t wait for your book to come out! Thank you Renee for your posts during 2018,always look forward to opening them when I see your name in my inbox. Very nice post, thanks for sharing this so openly 🙂 It seems like you’ll have some great adventures and accomplishments coming your way this year! Thanks so much Amanda – you too! I love reading these types of posts, there’s always something I can relate to. Congrats on a fabulous year! I’ve followed you for a couple years now and it’s been so awesome to see your success. I’m glad to see that you addressed money and income goals. There’s this weird stigma around making money as a creative in particular that is really nonsense and I hope to see fade. Also with you on intuition–that’s a lesson I’ve been learning, too. I’m really, really good at discounting my own intuition and experience, but that’s something I’d like to leave in the past. It was a weird year for me. For a couple years I felt I was making progress, but 2018 has been honestly garbage and I feel so much further from where I want to be. I’m dealing with a lot of personal pain like loneliness that I hope to see resolve in 2019. I did overcome quite a few things too, but on balance, I’m glad it’s over. I think I’m going to take inspiration from you and spend more time focusing on what I want, like deep, authentic connections and a home that makes me feel, well, home. It’s a good thing to do anytime, but especially when things aren’t going so great. Thanks for sharing Suzanne – it’s great to have you here! It sounds like 2018 was a little tough for you and I am sending some good vibes your way for 2019. Those are some fantastic goals to work towards. You’ve got this! I love this post! Congratulations on an amazing year! I love watching you grow. And I love that you are real. You don’t only talk about unicorns and rainbows. You talk about lows and being human which is so important! Not only for you but for this community. I am really excited to write the 12/31/2019 journal entry! Manifestation is real!! I did a similar exercise last year but with very small things, and they all came to fruition! And this year I have so much more planned. I am really excited for what is to come. Yay! That’s so exciting to hear Nichole! I hope your 2019 is INCREDIBLE! Hi Renee! I have been following you for quite awhile on Instagram while I get up my creative courge to officially launch my new travel blog! It has been in the works for about 6 months, but I am planning on rebranding it for ‘official’ release all of January. I am also a big fan of your Pinterest. I know you have recently hired someone to drive traffic to your Pinterest, but how would you suggest driving traffic at the beginning of starting a travel blog? Did you ever use Tailwind? Thoughts on it? Thanks again and hope to hear from you soon! That is very exciting Cori – good for you! I initially took Melyssa Griffin’s Pinterest course and learned a lot through that. Though I always felt like I didn’t have enough time to really put into making my blog traffic increase to where I wanted it to be. So I hired some help and yes my assistant does use Tailwind, which she believes to be beneficial! There are tons of free blogs and YouTube videos online that breakdown strategies of increasing blog traffic from Pinterest, or you could consider signing up for a course like the one from Melyssa. Good luck! You did a post on IG awhile back about combining your journals. I think you even mentioned a product. I can’t find it now, but I am interested in doing something similar to get my thoughts organized. What product are you using for planner, journals, etc? Thanks for sharing Renee! This inspired me and I even created a new Pinterest board for it (and other motivational content surrounded from blogging and traveling). Honestly so glad you mentioned money because I almost feel like it’s a taboo to even mention it, but I think it helps us relate to people MORE. Thanks Courtney! I also agree about the money chat, I think it should be totally okay to be able to talk about income goals!